Take better care with a pad that's seriously flexible. U by Kotex® CleanWear® Ultra Thin Pads now feature 3D Capture Core, a one-of-a-kind center that locks away wetness to help stop leaks. Designed to move with your body, uniquely shaped wings help prevent bunching so you can rest easy with this nighttime protection. I absolutely love these. 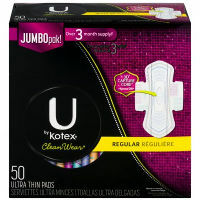 I always look for the Kotex brand.